Part of the trend towards investing in a modular system is single-source responsibility, meaning a source that is selected due to specific reasons, e.g. price advantage, quality, support, delivery, etc. Advantages are realized by a customer when a manufacturer accepts the responsibilities that go with building a modular system. 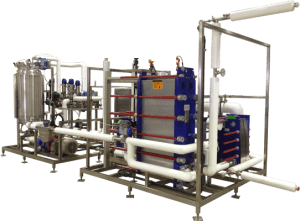 What are the benefits that the customer or end-user realizes when a modular system manufacturer accepts single-source responsibility of a system vs. having the system being ‘stick-built’ at the customer’s facility. 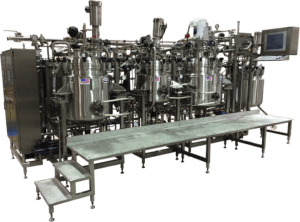 One of the biggest advantages of buying a modular system is one company can be held accountable for all aspects of a project, including the ability to design, engineer, fabricate, and properly manage all aspects of a project, such as providing clean in place (CIP), UF, HTST, decontamination, batch, blending, and other types of processing or utility systems. A significant amount of time and effort is spent administrating projects, including soliciting/reviewing bids, placing purchase orders with multiple suppliers, expediting/receiving components, entering invoices, and finally paying for equipment. By placing a single purchase order with one supplier, all of these associated costs and headaches go away. The overall size or dollar value of the project typically determines the quantity and schedule of payments over the life of the project. Risk reduction is also one of the goals any customer has when implementing a project. These risks can come in the form of schedule delays, cost overruns, misapplication in the design, and many other factors. Involving one company, and making them the responsible party for the overall success of the project, allows the customer to communicate directly with one entity and apply pressure to ensure the project success — which becomes much more difficult when coordinating efforts with multiple firms. Most projects go through a certain amount of change during the life cycle of the project. Minimizing construction and design discrepancies is an advantage when building a modular system through a single design-build company because any requested changes are seamlessly and quickly transferred from the customer to the supplier — rather than disbursing the information among multiple design, management, and fabrication firms. Reducing the number of companies and individuals involved in the transfer of information will better ensure that changes made to the design are also captured in the construction phase of the project. The overall schedule for a project is greatly affected by the number of changes that occur during the life cycle of the project. This is typically due to design changes, which in turn affect material deliveries, etc. One factor that can be better controlled by sole sourcing a modular system is reducing the decision cycle, and consequently better controlling the overall project schedule. In many cases, projects have multiple companies involved, which include engineering/design, construction management (CM), project management (PM), and the different trades working on the project. By reducing the companies involved, decisions can be made more quickly, which allows the overall schedule on a project to be maintained. Finally, a reduction in litigation claims and overall insurance costs will be realized by fabricating equipment in a controlled shop environment. A primary goal of any customer, when building new or adding equipment to an existing facility, is the ability to source equipment at the lowest and most economical cost possible while maintaining a high level of quality. Modular system suppliers, who provide turn-key systems, have the necessary design, engineering, management, and fabrication capabilities to properly do so. Internal engineering and construction procedures are developed to expedite the design, fabrication, and management aspects of a project, and are constantly refined to minimize the overall time from project kick-off to start-up and commissioning. Saving time equates to saving money when sourcing and building equipment. A reduction in the overall length of a schedule consequently reduces the cost of the project. In this installment, we will review some of the many ways in which cost savings can be realized when building a modular system. • Travel and living expenses associated with outside contractors going to and from a job-site each day are eliminated. • No wasted time is spent each day on handling, unlocking, and locking up tools at the beginning and end of each day, which commonly occurs at an open job-site. • Delivery and storage of materials and equipment provided for fabrication are readily available and better controlled in a closed shop environment. Consequently, labor efficiencies are much higher, reducing the overall time required to fabricate the equipment. • Construction delays and costs associated with them, i.e. loss of power, weather, labor strikes, equipment and material deliveries, are minimized when fabricating a modular system in a controlled shop environment. • All materials shipped to an open site must be received and transported to either storage or final assembly. Coordination costs and the risk of damaging or losing the materials are greatly increased. Safety at an open job-site and eliminating any accidents that can commonly occur when having multiple, independent trades working there, is an important goal that all customers strive to achieve. Many man hours are dedicated toward safety at an open job-site, coming in the form of periodic safety meetings and safety over-site by dedicated individual(s) on the project. A new or different tradesman that comes to site typically has to go through safety training, resulting in wasted man hours by the trainer and trainee. Safety at a modular system supplier is equally important, but many less man hours are spent, since the workforce is stable and does not require the constant training of new employees that occurs at an open job-site. Since Henry Ford installed the first assembly line in 1913, it has been proven that repetitive actions allow for an increase in efficiency. 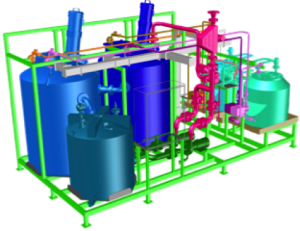 Modular system manufacturers utilize repetitive procedures and construction practices in designing and fabricating systems. Engineering and design procedures developed for each task on a project are utilized from one project to the next. Fabrication practices and ‘tricks of the trade’ are also utilized from one project to the next. These efficiencies are passed on to a customer in the form of cost savings because of the reduced time required to complete the disparate activities. These same efficiencies are not realized when stick building a system onsite, since the players, design methods, and management procedures involved vary from one project to the next. Cost increases associated with changes in scope or because one of the groups involved in building a system onsite ‘didn’t receive the correct information’ are reduced. Stick-built systems involve many different groups to complete a project, such that it becomes very difficult to actually capture the cost of a system, while modular system manufacturers very typically provide a ‘firm bid’ for a project, based on a defined set of deliverables. In our case, if a process flow diagram is not provided as part of the Request for Quote (RFQ), one is developed, along with preliminary Bills of Materials (BOMs) to ensure the customer/end-user has a complete understanding of what is being provided in terms of equipment and services. Cost increases or overruns are greatly reduced because the scope of the project is clearly defined at the start.